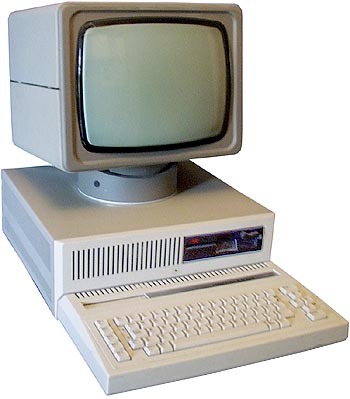 The Robotron A-5105 was intended to be used in former Eastern Germany schools where it should replace the outdated KC line of computers. Therefore, it was also called BIC which stands for "Bildungscomputer" ("educational computer")..
Up to 16 computers could be linked into a network which was comprised of one teacher computer and several pupil systems. Each station could access the printers and plotters. A monochrome monitor was attached to the case but one could also connect a colour RGB monitor or a TV set. The network software was called BICLAN. The machine ran SCPX, a special version of the CP/M operating system. The RBASIC interpreter was also in ROM. Some of the information on your page is related to a different computer, the Robotron A 5120, which is a typical CP/M business system. The numbering of Robotron computers has been somewhat strange. Your picture of the A 5105 shows the computer and the disk drive box - in fact, the whole computer is built into the part that also contains the keyboard. At the left upper part of the keyboard, you can see the module port. The modules are compatible with the KC 87 modules. Because of the political changes of 1989, only very few A 5105 machines were made. The same case design was used by Robotron for another computer, the "KC compact" which was an Amstrad CPC clone. Like the A 5105, the KC compact remained a rarity, as these old-fashioned machines proved to be unsellable after 1989, when western computers became available in former Eastern Germany. see more Robotron A5105 Ebay auctions !